Creating your DIY wedding centerpiece does not have to be complicated and it doesn't have to cost a fortune. Making your own centerpieces can save you loads. The first step is to think about your theme and the shape of your tables. If you have round tables then you are more likely to have one centerpiece in the middle of the table, if you are having long tables then you will have smaller and possibly longer centerpieces dotted along the tables. Also if you want your centerpieces to be cheap you need to work out how cheap they need to be. What is your budget for your centerpieces? When you know divide the amount by the number of tables and don't forget the top table in the numbers. Or themed to your colors. When you have your theme it is a good idea to stick to your budget as this way you won't be tempted to buy everything you see that could possibly fit your theme. Buy only what you need to make one diy wedding centerpiece to start with, this way you won't be wasting lots of money if you change your mind and make sure you keep all of your receipts so you can take anything back if it is more than you need. Every wedding centerpiece needs a base, it is what you will create your centerpiece from, and by a base I mean things like a mirror tile, or a basket, or a bucket, or a vase, or a hurricane lamp, or a glass bowl. A great place to save loads of money on these is by looking at Ebay Wholesale Lots, you can find some amazing bargains, true you can also find some very strange items but is is well worth looking through all of the items to find what you are looking for. Also have a look at wholesalers and buying in bulk, here are some great inexpensive centerpiece vases and candles that would be a good start to your design. When you have your base and your theme all you need are a few extra decorations to complete your centerpiece. Do you need candles, sand, paper butterflies, stars? The list could go on and on! Have a look at craft stores and consignment shops and don't forget to ask your friends and family if anyone has recently got married as they are bound to have lots of decorations left over from their own wedding. 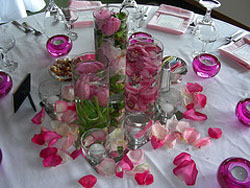 And don't worry about your centerpiece looking the same, it won't as you will be arranging things differently. The key to creating a beautiful diy wedding centerpiece is to keep it simple, do not be tempted to go over the top as these centerpieces can end up looking tacky and cheap. Simple and classy centerpieces look great, here are some easy ones for you to recreate! A candleabra with white candles and ivy around the base, glass vases filled with pebbles or shells with a floating candle on the top, baskets filled with candies, mirror tile with candles, a cake stand filled with favors or cakes, scattered rose petals, glass bowls filled with fruit, tall vases filled with peacock feathers, and there are lots more cheap wedding centerpiece ideas here!